Archaeologists have restored the original marble seal on the landmark Jaffa Clock Tower. Visitors to Jaffa will now be able to see the original seal of Sultan Abd al-Hamid II on the Jaffa Clock Tower. The tower stands at the northern entrance of Jaffa, the ancient city next to Tel Aviv. The tower dates to 1903 and was built to commemorate the 25th anniversary of the reign of the Ottoman Sultan Abd al-Hamid II. It is one of more than 100 such towers built for the occasion throughout the Ottoman Empire. Al-Hamid ruled from 1876 to 1909 and was known for his despotic rule and for the widespread pogroms and government-sanctioned massacres of Armenians and Bulgarians that occurred under his reign. He was the last of the Sultans to exert effective autocratic control over the disintegrating empire. 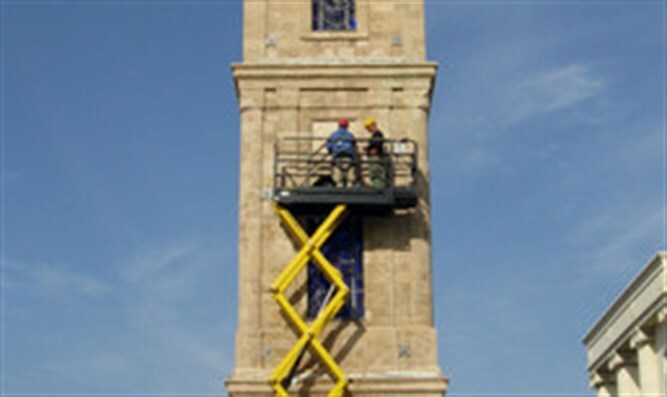 Over the last year, the tower has undergone considerable conservation measures, sponsored by the Tel-Aviv municipality and under the supervision of the Israel Antiquities Authority. “During the course of the work, it became apparent that the original marble seal (tughra) bearing the symbol of Sultan Hamid Abdul II was in a poor state of preservation,” the Authority said. The seal was one of four on the structure and the only one that has survived the passage of time. In 2001, three glass replicas of the seal were installed to take the place of the three marble plaques that did not survive. There, conservator Mark Avrahami, performed the reinforcement and restoration work, including a new support for the seal, which had faded completely, and was accentuated utilizing pigments. Upon completion of the work, the marble plaque was returned to its original location two weeks ago. The seal, or tughra, as it’s known, is a calligraphic seal that was affixed to all official documents and correspondence under the Ottomans. The Sultan’s tughra was also stamped on the coins minted during his reign.